What will Specter do with the rest of his Senate term? 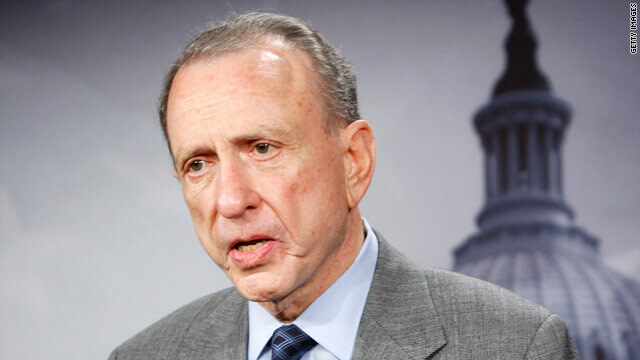 Washington (CNN) -- After being beaten in his bid to keep his seat, Sen. Arlen Specter will make the most of the remainder of his term in office, some observers predict. "This is not a guy that is going to take his last several months in the body and coast," said Norm Ornstein, a congressional scholar at the American Enterprise Institute. "He's going to live it to the fullest." Specter became the biggest incumbent to be beaten in this anti-Washington election year, losing to fellow Democrat, Rep. Joe Sestak, in Tuesday's primary election in Pennsylvania. Specter was a Republican for most of his 30 years in the Senate but switched parties last year after voting with Democrats on President Obama's stimulus bill. Specter will re-emerge in the political stage at the end of June when the Senate Judiciary Committee, on which he serves on and previously chaired, will hold confirmation hearings for Supreme Court nominee Elena Kagan. "Certainly you're going to see Specter throw himself into the nomination confirmation hearings for Kagan and other significant confirmation battles if there are any," Ornstein said. Erin McPike, a congressional reporter for National Journal, said Specter will set the tone for the confirmation debate and "leave a legacy in that way." "A lot of these hearings have gotten incredible attention," she said. "I think Specter will want to write that impression and be a leading voice as he leaves." And it's unlikely, an expert said, that he will actively go against Kagan, who is currently the country's solicitor general. "Having switched sides, he's been pretty much of a team player," said Alan Abramowitz, a professor of political science at Emory University. "Of course you might say that since he's lost a primary, it kind of frees him up to do whatever he wants. But I'd still would not expect to see him opposing Kagan." After meeting with Kagan recently, Specter called her a "good candidate" possessing excellent credentials -- though wouldn't say how he would vote. But his recent comments come after he voted against Kagan during her solicitor general hearings -- criticizing her for not answering questions about her legal beliefs. That vote became an issue in his campaign against Sestak. Specter also will likely play an influential role in getting the Democrats' future legislative items passed. Ornstein said that the senator likely will immerse himself in the remaining debates on jobs, financial reform and even the climate-change bill which was recently introduced in the Senate. "I could also imagine him stepping in and getting a little more involved with the energy/climate-change issue -- things where you're looking for people in the center who can bring others together," Ornstein said. And don't expect Specter to go rogue against his party, Abramowitz added. "I wouldn't expect to see his voting record to change at this point," he said. "Having switched parties, I would expect him to continue pretty much voting with most of the Democrats in the Senate for the rest of the time that he's there." For his part, Senate Majority Leader Harry Reid has had nothing but praise for Specter -- noting his vital support in passing the Democratic-backed health care reform legislation in the Senate, which was later signed into law. "I'm sure we'll keep hearing from him because he's obviously still active and involved in what's going on around him," Abramowitz said. "He's not ready to move into a nursing home." Specter may also take a page out of Sen. Chris Dodd's playbook, after the Connecticut senator announced earlier this year that he will not seek re-election. Dodd, as chairman of the Senate Banking Committee, has played a key role in getting the Wall Street reform bill through the committees. The fight now is to get the bill, which was passed by the House, to the Senate floor for a vote. A vote to end debate and bring the bill to a vote failed on Wednesday. Unlike Dodd, Specter does not have the seniority he once had after becoming a Democrat. In essence, the move jousted him from the seniority he received as a Republican and dropped him to the status of a junior member of the Senate amongst Democrats. "I don't think he's [Specter] in a position to have as big an impact on these debates right now being a relatively junior member of the party despite all his years of experience," Abramowitz said. "Again, it's hard for him to help set the agenda or even shape the legislation except on virtue on having his one vote." But it's his relationships with fellow senators that may help him garner support behind one of his pet projects. "Knowing that he's going after this long career, you're going to have some people try and be sensitive to the things he wants to do now, recognizing it's his last chance to do them," Ornstein said.